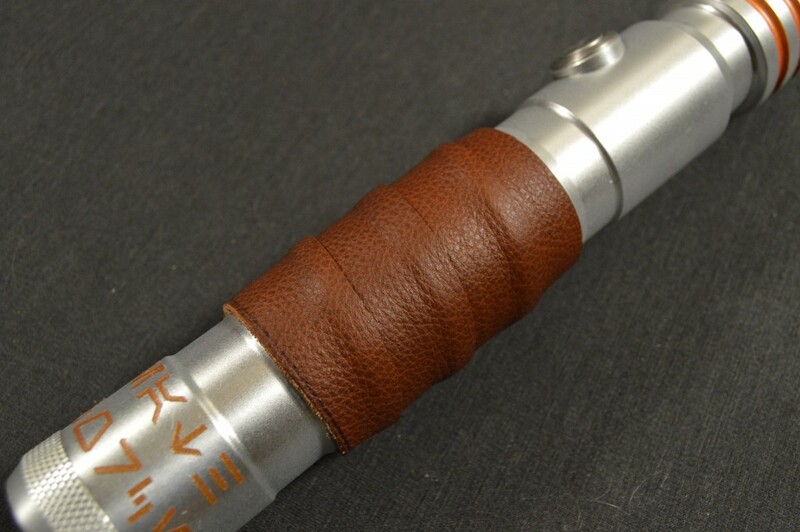 As I mentioned in my review of the hilt, Ultrasabers’ Initiate LE V4 is a dignified looking saber, but it is just a little too plain for my tastes. Seeing as how the Initiate was a grab bag purchase, I couldn’t complain much. As it arrived, the saber was really a $90 hilt that I managed to snag for $55. That’s undoubtedly a fantastic deal and it left me plenty of room to do some customization. Once I figured out what I wanted to do with the saber, I wasted no time getting to work. The first thing I did to the Initiate was to convert it to USB battery bank power. 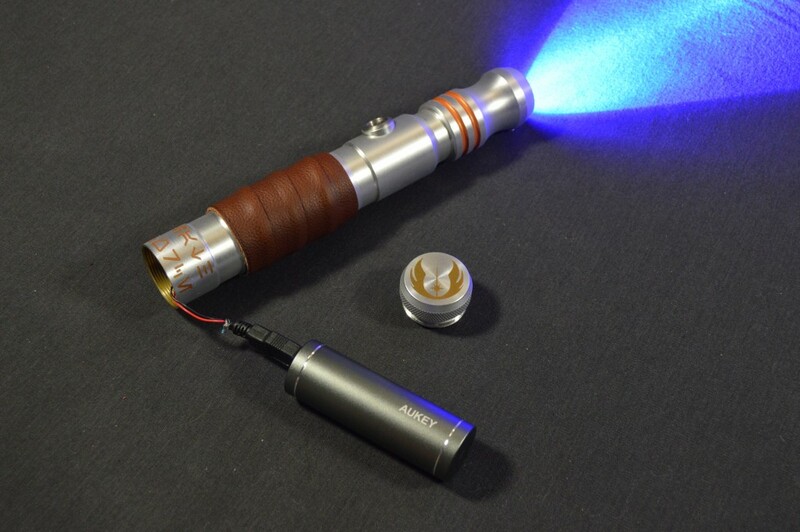 USB banks typically offer 5V of power and 2A of current, which happen to be perfect for most stunt sabers. 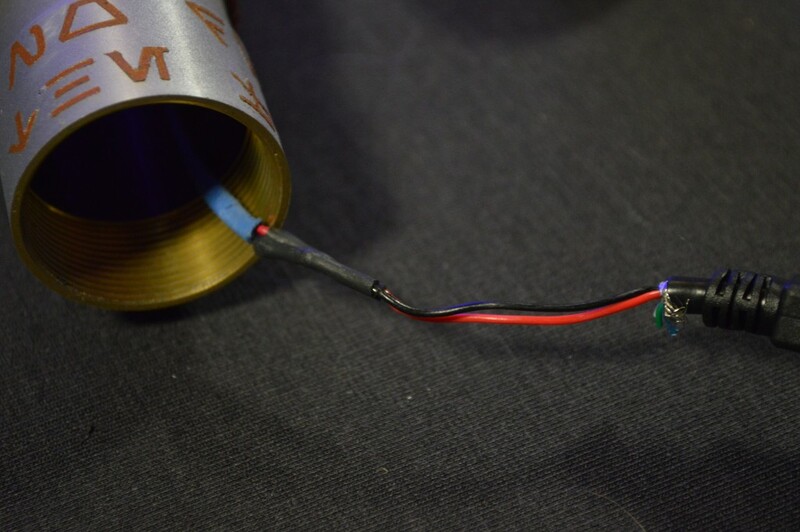 Since this Initiate was already configured to run on four AAA batteries, it came with an appropriate resistor for between 4.8V and 6V power supplies. The USB bank falls squarely within that realm. The USB battery conversion greatly increases runtime. The USB bank also offers far more capacity than your average AAA setup. While most AAA batteries fall below 1,000 mAh, the Aukey USB bank I used in this hilt offers a whopping 5,000 mAh. 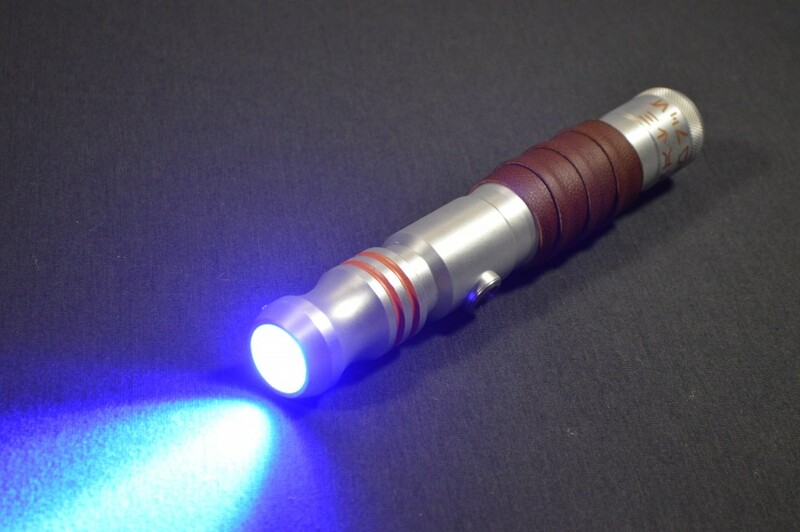 Single LED sabers typically pull around 1A, so the USB power supply theoretically provides five hours of charge. It looks like the cables are shrink wrapped together. Rest assured, they are not. After making the battery change, I started on the paint. My initial plan was to use Testors model enamel in copper for all of the grooves on the hilt. After applying it, I was not happy with the durability or appearance of the brushed-on paint. I chose to leave the Testors paint at the top of the emitter as an accent, but removed it from the saber’s grooves. 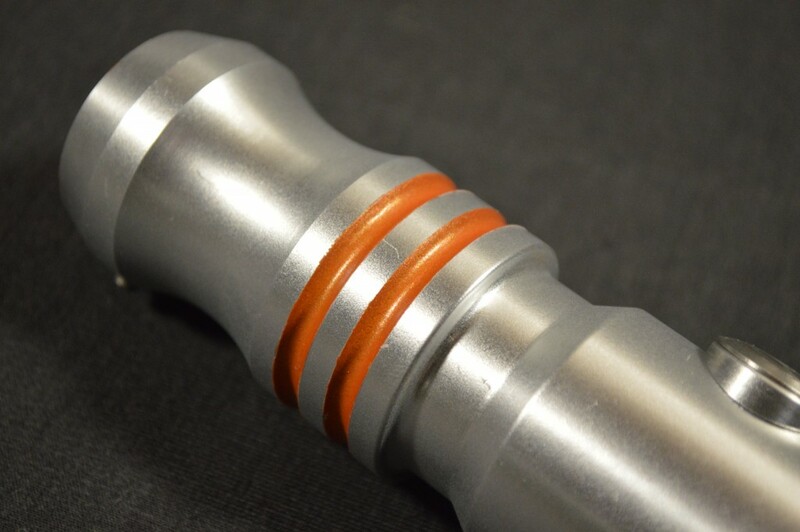 Effectively back to my starting point, I decided that a sprayed finish would look better in the hilt’s grooves. After a coat of primer, I applied three coats of Rustoleum Universal in Sierra Mist. This orangey-copper color contrasts nicely with the blue LED and blade. The hilt was still a little too plain, though. 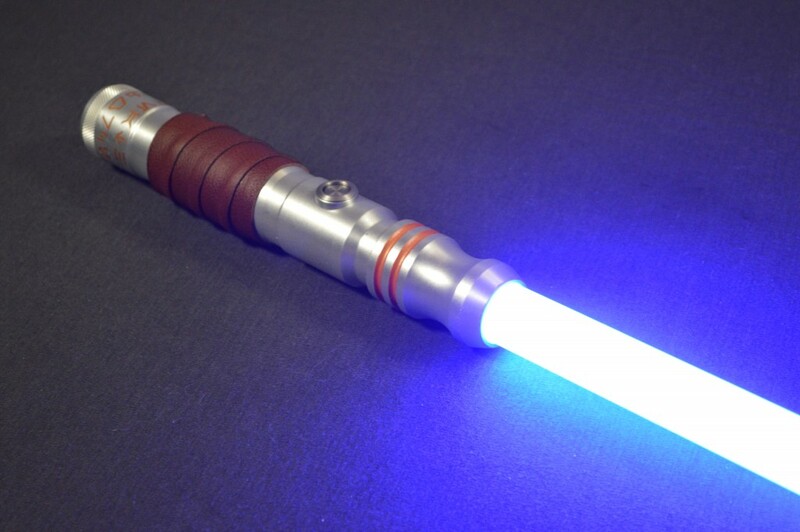 Rustoleum’s Sierra Mist is an excellent color for this saber. 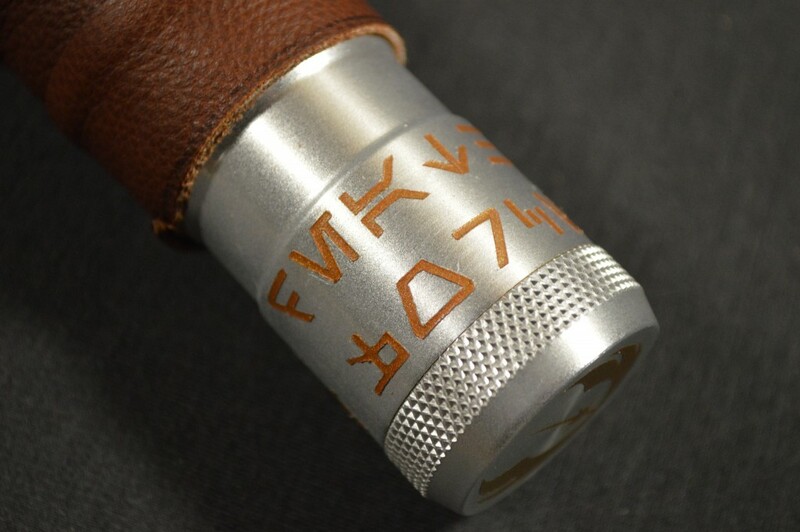 In keeping with the Old Republic look of the hilt, I thought it would only be appropriate to include a portion of the Jedi Code on the Initiate. I own a Silhouette Cameo vinyl cutter and I have used Oramask masking vinyl for projects on my other site, Modern Rifleman. My past experience told me that the full Jedi Code, or even any full lines of it would be too long to fit without making the Aurebesh type far too small.to apply. Therefore, I opted for an abbreviated phrase which states, “No death, the Force” and is split over two separate lines. 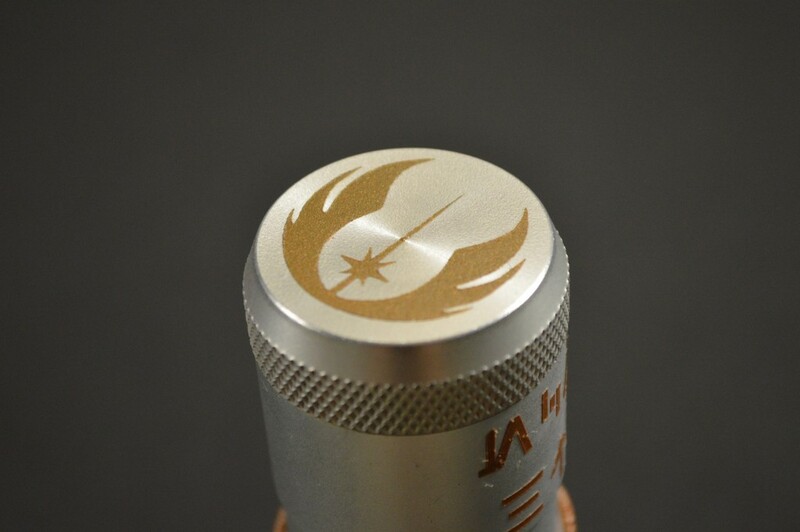 Rounding out the painted customization is the Jedi symbol on the pommel. The round bird shape of the crest fits the pommel of the saber well. Once this final paint detail cured, I then applied several thin coats of acrylic clear coat in satin. This gives the hilt somewhat of a frosted appearance, but does not disrupt the overall look. The final piece I added is a leather wrap from Defcon4 over at the Imperial Royal Arms forums. Defcon sells a variety of different wrap colors and thicknesses. 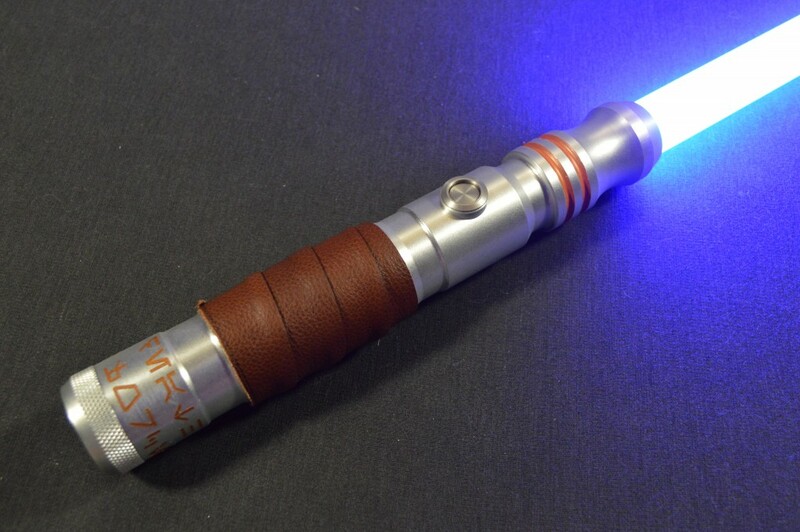 This particular example is his dark saddle brown, which I feel suits the saber very well. 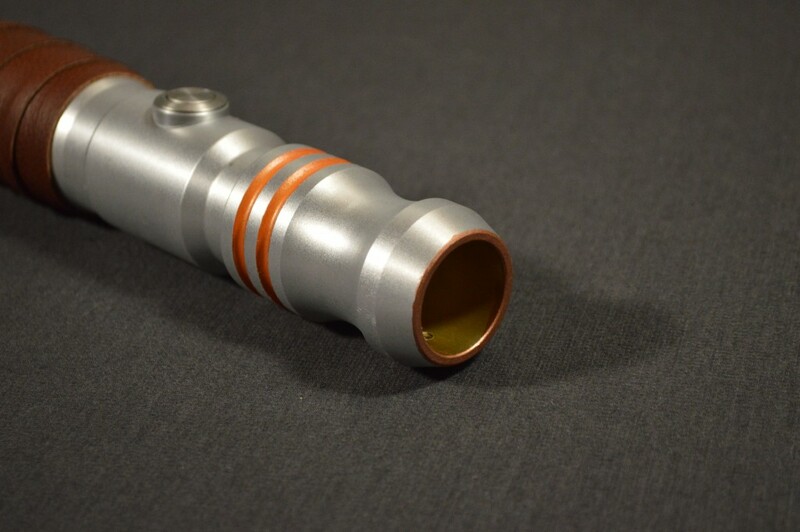 This custom hilt is currently available in the Arms of Ilum store. If you’re interested, please check it out here.